As you may have noticed, this GrottoCast site has not been updated lately. That is because things have moved to the Assumption Grotto website. Apologies for the delay in getting the word out. Please visit AssumptionGrotto.com. There are various ways to follow. But one of the best ways is to subscribe by adding your email address to the field in the upper right side bar there. Come to Assumption Grotto on September 25th for a Sunday afternoon talk by Joseph Pearce on the Catholicism of Tokien’s books, “The Hobbit” and “The Lord of the Rings”. Seating is on a first-come, first-served basis. This is a parish fund-raising event. Free-will donations are appreciated at the door of the gym with a minimum suggested donation of $6 per person, and $25 per family of five or more. Children should be of sufficient age to be attentive, not distracting. 100% of proceeds go to Assumption Grotto Church for ongoing maintenance of the church building, and grounds. Larger donations very much appreciated. Tax deduction letter for donations will be mailed upon request. There is secured parking. For September 25th only, Fr. 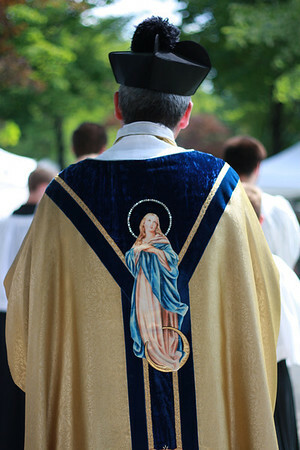 Perrone is moving the Extraordinary Form Mass (1962 Missal), and Assumption Grotto Choir, to the Noon time-slot. The 9:30 a.m. Mass will be the new Mass in Latin and English, without the main choir. The parish has a weekly social with snacks. The gift shop will be open, and a bake sale is anticipated. If you are on Facebook, see the event here, and share it to inform others. This post contains links to a list of homilies that were part of a backlog brought about by some technical issues. While these were resolved soon after Easter, it took time to process the homilies. They have been on the parish Facebook page for just over a week. There were no homilies captured for Holy Week and Easter Sunday, except for the Easter Vigil homily of Fr. Aidan Logan, O.C.s.o. who was visiting. For Divine Mercy, we have Fr. Perrone’s homily, delivered at the 6:30 a.m. Mass. We have two homilies for the Third Sunday of Easter: First, there is Fr. John’s homily from the 9:30 a.m. Mass. He gave special permission for this homily to uploaded. In it, he discusses, briefly, the Holy Father’s letter, Amoris Laetitia. We also have Fr. Perrone’s homily from the Noon Mass. Finally, on April 17th, 2016, Fr. Perrone addressed all of the Masses. It concerned a recently discovered Eucharistic sacrilege, and some thoughts in general about Eucharistic reverence. The handout he mentions in his homily can be found in PDF form here. Lastly, we are still working on getting audio from April 24th; and, there is no audio recording for May 1st since it was CSA weekend. In his weekly column, Fr. Perrone recalls some past encounters with Mother Angelica, in light of her recent death. See the full text here since the bulletin will only be online for a few weeks. On another note, there have been some issues with homily recordings, but we do have some from Easter weekend that will soon be processed. Today was the fourth Sunday and Lent, also referred to as Laetare Sunday. This post contains both, this week’s, and last week’s homilies by Fr. Perrone, for the third and fourth Sunday in Lent, respectively. We will start with last Sunday’s homily for the third Sunday in Lent. Here are a couple more images from the Laetare Sunday Mass taken with an iPhone. This is from the post-Mass Rosary led by Fr. Perrone. It happens after all Masses at Grotto, for those able to stay. This homily was delivered by Fr. 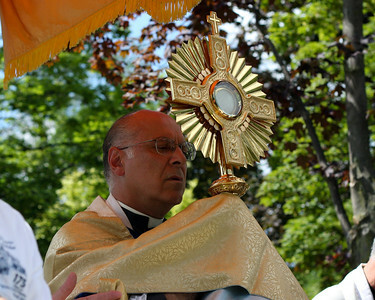 Perrone at the 9:30 a.m. extraordinary form Mass for Quinquagesima. Thanks to parishioner Beth Y. for this week’s photograph used in the player. If you are a subscriber of GrottoCast and received an email for the post on Lenten talks by Fr. Perrone, it contains an error on the time for Stations of the Cross, followed by EF Mass. The post originally had the talk starting at 6:45 PM, and Mass starting at 7:00 PM. This was an error since the talks are around 40-45 minutes. Fr. Perrone’s Reflections on the Psalms: 6:45 to about 7:25. See the original post, corrected, here – with the flyer showing all dates Fr. Perrone is talking, other information about the Fish Fry, and more.